This post is a travel guide about the best day trips from Baku into the Absheron peninsula for the independent budget traveller. Baku is located in the middle of the Absheron peninsula. This area is the heart of Azerbaijan’s land of fire with some of the best day trips from Baku. This travel guide will not only show you which day trips from Baku you can make, but also how to organize them yourself without the need of an expensive tour. Tours to the Absheron peninsula tend to be pricey, but are not necessary to explore this fascinating area. It is easy to make day trips from Baku on your own using public transport. Why visit the Absheron peninsula? If you stick to Baku you will only get to see a small part of Azerbaijan. The modern capital has done a good job showing off its oil wealth, but obviously this is not the whole story. It all felt a bit artificial to me and you almost forget thst this area had a rich history on the Silk Road. I wanted to learn more about Azerbaijan’s vast reserves of gas and oil and to see what was behind the glitter and glamour of Baku. It was only when I made some day trips from Baku that I got to see a different side of Azerbaijan. Beyond Baku into the Absheron peninsula you will find a strange world of pollution, poverty and corruption, but also ancient history that shows the interesting past of Azerbaijan. Ottomans, Persians and Russians dominated the landscape in different times resulting in Azerbaijan’s own unique cultural traditions. Authentic Azeri culture is hard to find in Baku, but the Absheron peninsula offers a glimpse into the soul of Azerbaijan. In my hostel I met a friendly lady in her sixties who decided that now was the best time to travel to Azerbaijan. We decided to explore the Absheron peninsula together. The first day we went on a tour through our hotel, but the second day we traveled on our own using public transport. The sights on our tour were rather peculiar. What was maybe the most amazing thing of the day was how ugly things were outside of Baku. We were in shock because of the pollution. Every inch of the soil was exploited by the oil industry with abandoned pipes and machineries left to rust. Whole fields of iron donkeys dotted the dry desert landscapes. A quick search on Google showed that nearby Sumqayit is in fact one of the most polluted cities in the world. This is not a reason to dismiss the Absheron peninsula. It gives a fascinating look into Azeri culture where ancient traditions and superstitions survive alongside the cultural influences left behind by the Ottomans, Persians, Russians and others that once passed through the lands of fire. Exploring the Absheron peninsula was an interesting way to look beyond Baku where people live a less glamorous life. Soviet flats still dominate the suburbs and the local citybuses are rusty and always packed. There is maybe not deep poverty but people live a simple life amidst pollution. Needless to say the oil wealth is nowhere to be found. Our first stop on our day trip from Baku during our tour were the Qobustan mud volcanoes. Far outside of the city we drove through polluted desert untill we stopped in the middle of nowhere. In the distance we saw the blue sea waters, but all around us it was an empty wasteland, except from some small hills spitting mud. Almost half of the 800 mud volcanoes in the world are in this area. We weren’t too excited about the bobbling and spitting muddy waters. Although it felt like I was on the moon rather than in Azerbaijan. How to get there: Either by taking a taxi straight from Baku or by taking Elet bound bus 195 till the south end of Qobustan and take a taxi from there. More tips on how to reach the places to visit in the Absheron peninsula is further down. Our second stop on our day trip from Baku was much more interesting than the mud volcanoes. Up on a hill were several caves with very old petroglyphs of animals, hunters, warriors and dancing people. It shows the long history of human habitation in this region. There are more than 600,000 rock paintings depicting prehistoric life. The landscape was once full of green forests which was hard to believe when we looked at the desert around us. On the way from Baku to Gobustan is the Bibi Heybad mosque. The Shirvanshah dynasty built it in the 13th century around the tomb of Ukeyma Khanum, a descendant of Mohammed. In Azeri culture a pir is a holy place that is often associated with the grave of a holy person. The Bibi Hebat Pir became an important place of worship for local people. During communist rule it was destroyed, but when Azerbaijan gained its independence they immediately reconstructed the mosque to its original design. The new building is quite impressive, but most pirs are simple shrines marked by a piece of colorful cloth tied to a tree. They have grown rapidly throughout the country after the collapse of the Soviet union and there are several important pirs in the Absheron peninsula. To read more about pirs in Azerbaijan I can recommend this article about the persistence of pirs. The last stop on our day trip from Baku was a burning hill where natural gas evaporates from the earth. It was accidentally set on fire 50 years ago by a shepherd lighting his cigarette. It has been burning ever since, despite rain and snow. Even some of the streams near Yanar Dag can be ignited with a match. Locals believe that the burning springs have curative powers. The next day we decided to explore the Absheron peninsula on our own. Our first stop was Ateshgah, the fire temple. A very popular day trip from Baku, because of its historical significance. Like Yanar dag natural gas evaporated from the soil and lit a fire that kept burning. It was a place of worship for both Zoroastrians and Hindus. It’s origins remain unclear, but in the 7th century people already believed it was a holy place. In the late middle ages Indian merchants built the current structure. You will find inscriptions in Persian, Sanskrit and Punjabi. The current fire is no longer natural as the gas reserves have been depleted under Soviet rule. After the fire temple our day trip from Baku continued. We took a bus to the Mir Movsum Agha pir. Mir Movsum Agha was a disabled person, but locals believed he had supernatural powers and cured many diseases. People still visit his grave looking for miraculous cures believing that a visit can make any wish come true. As with many pirs people sacrifice animals, sweets and money to the shrine, especially when their prayers have been answered. The Mir Movsun Agha pir receives hundreds of visitors each day and they collect enough meat to help 600 local people that could otherwise not afford to eat meat. Our last stop on our day trip from Baku was the small town of Mardakan. One of the oldest villages in the Absheron peninsula with the old Mardaken castle from the 13th century. Here was another interesting pir. The Hassan pir is a shrine where they smash bottles above someones head to cure nervousness of spirit. Often patients first undergo childagh, a mystical treatment to relieve shock, fear and anxiety. The ancient practice involves burning cloth rolls that are used to touch certain nerve endings. To visit all of the above places you need at least 2 or 3 days, depending on your mode of transport. Some of the places are easily combined on a single day trip from Baku and later on I will give some example itineraries, but first I will explain the different transport options you have. The easiest and most expensive way to explore the Absheron peninsula and arrange your day trips from Baku is to take a tour from one of the travel agencies. Bag baku runs tours from 40 manat onwards depending on the amount of people that sign up. Therefore prices can vary a lot among the tour companies. The more people they have, the cheaper the price. Most hostels also offer similar tours so I can recommemd to talk with your hostel and negotiate a good price with them. The more people, the cheaper it is per person. So it helps if you can find other people in your hostel to join the trip. In theory this would be the cheapest option to arrange your daytrips from Baku if you dont want to take public transport. However, you need very good negotiation skills and a good intuition to know whether you have a trustworthy driver. Also keep in mind that if you want to visit Gobustan, the mud volcanoes requires to go off road and not every cab in Baku wants to get their car dirty. In addition, they might not even know where the mud volcanoes are and they are not easy to find. Prices to Gobustan start from 45 manat onwards, depending on how many other things you include in your trip (Yanar dag or the fire temple). Renting a car is not the cheapest option, but also a possibility in Azerbaijan and this would allow you to visit most places in a single day. Do keep in mind that the Gobustan mud volcanoes are almost impossible to find on your own and that the road is horrible (read: non-existent). Travelling the Absheron peninsula by public transport is not straight forward, but not that difficult either. Making daytrips from Baku using local buses and the Metro are very well possible. There are frequent connections and locals will help you find the right bus. Public transport is very cheap in Azerbaijan and this will save you a lot of money compared to the expensive tours. The answer to the question whether you can better take a tour or travel on your own when you plan your day trips from Baku is not that straightforward. Tours to the Absheron peninsula can be expensive, but you pay per car and driver so the price depends on the amount of people.Therefore it is worth asking at your hotel and some of the tour agencies what they have to offer. They might have several people willing to go making it a cost effective way to explore the Absheron peninsula. If you are a solo traveller planning day trips from Baku, I think it is easy enough to visit most places in the Absheron Peninsula by public transport. The exception are the Gobustan mud volcanoes and petroglyphs that are difficult to get to. The Gobustan mud volcanoes and Gobustan petroglyphs are the most difficult to get to. My advice is to find other people that also want to go and arrange a tour through your hostel or a travel agency. Make sure to include a stop at the Bibi Heybad mosque on the way. This trip is easily done in half a day and I can recommend to visit the burning hill of Yanar Dag the same day. Either try to include it in the tour or visit it yourself by public transport in the afternoon. 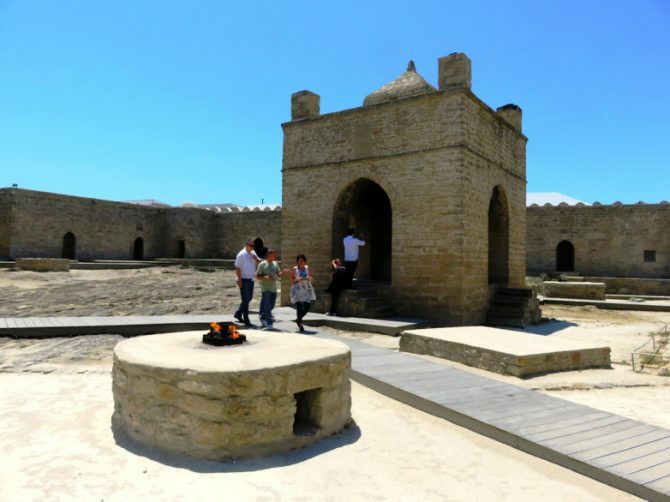 Start your second day trip from Baku at the Atesgah fire temple. It is easy to travel from Baku to Atesghah and there continue with bus 136 to Mir movsun agha. From the fire temple it is a 5-10 minute walk to the bus station where bus number 136 passes by. From Mir movsun agha take bus number 136 again to Mardaken to visit the Mardaken castle and the Hassan pir. The Absheron peninsula is safe to visit whether you travel by public transport or take a tour. People in Azerbaijan are very friendly and helpful. The more you go off the beaten path, the less people are used to see foreigners. You might receive some curious stares and smiles, but this is nothing to worry about. In the summer the sun can get pretty strong and especially in Gobustan there are few places with shadow. On your day trips from Baku bring a good sunscreen and sunhat. Also take plenty of water to drink with you and some snacks. There are not a lot of shops around in Gobustan and it might be difficult finding a place to eat. I travelled alone throughout Azerbaijan for two weeks and had no problems taking the usual precautions. Azerbaijan is a muslim country, but Baku is a very modern and liberal city. Outside the city things are a bit more conservative though, including the Absheron peninsula. If you make day trips from Baku it helps to dress modestly. For women this would be to cover your shoulders and avoid short skirts or trousers. You might occasionally get some male attention and it is best to ignore this or be firm and clear his attention is unwanted. To read more about everything there is to see in Baku you can read my post about The best things to do in Baku.